Cure-Aid® Dressing Strip POVI is a wound dressing with antimicrobial absorbent iodine ointment containing wound pad. 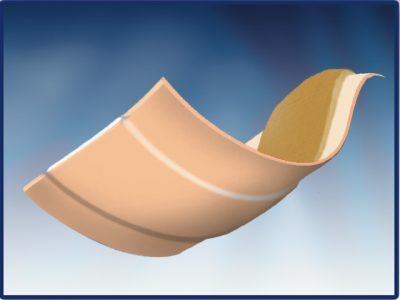 The pad is composed of nonwoven felt laminated with iodine ointment impregnated gauze; the whole composite is laminated with PE net which acts a non-adherent wound contact layer. Upon contact with wound exudates, the iodine is released offering a broad range antimicrobial activity against gram positive and gram negative bacteria, yeast and fungi. The dressing is made of different backing materials like polyethylene film, Polyurethane film, rigid fabric, Elastic fabric, elastic nonwoven, rigid nonwoven, PE foam, printed PE film with children designs. Due to the presence of iodine, Cure-Aid® Dressing Strip POVI has a strong antimicrobial activity, so it’s ideal for protecting the wound, even if infected. Unlike other iodine impregnated gauze dressings available in the market, Cure-Aid® Dressing Strip POVI is non-cytotoxic, non-irritant and non-sensitizing, The product is specifically designed to allow controlled amounts of iodine to reach the wound bed to prevent cytotoxicity. Cure-Aid® Dressing Strip POVI has advantage over non adherent iodine impregnated gauze in the market that it does not require secondary absorbent dressing because it contains absorbent felt laminated to the iodine containing layer. Do not use PVP-Iodine containing Wound Dressings on patient with known sensitivity to iodine or one of the other components. 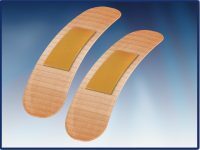 Cure-Aid® Dressing Strip POVI can be applied without secondary fixation dressing.